An island that formed off the coast of North Carolina in the United States in mid-2017 and that had become a tourist attraction lasted only eight months. A new satellite image taken by NASA has just revealed that the Shelly Island, formed last summer, off the point of Cape Hatteras National Seashore no longer exists. The US agency published an image captured by the Landsat 8 satellite and dated February 16, 2018, in which the islet no longer appears. To compare, in the image of July 7, 2017 the formation looks perfectly in front of the Cape Point of North Carolina. Even in August, the island grew up to 11 hectares. In 2017 RT reported the appearance of this island 1,500 meters long and 146 meters wide that suddenly appeared in front of Buxton and the locals baptized it as Shelly Island. Some experts said the island’s formation was likely to be brief. NASA reported that the causes of the formation and evolution of the island are "complex and not entirely clear", but it is believed that it appeared due to the accumulation of sand dragged by strong winds, and some coastal scientists have speculated that the conditions in 2017 were just right. According to NASA, the demise of Shelly Island was clearer since erosion happens frequently on barrier islands. 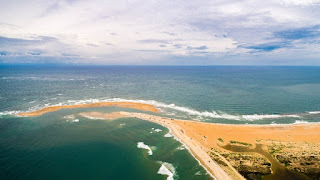 So, the disappearance is explained by the erosion that occurs over time in the barrier islands and that, in the case of the Shelly Island, was fueled by a series of hurricanes last autumn, including Irma, José and Maria. The storms split the island into two parts, and the winter storms destroyed their remains. The Shelly Island had a short life, but it enjoyed full attention from the media since it was formed. Last year, photos taken by Chad Koczera, a tourist from Connecticut, became viral on Instagram, which gave a boost to curious visitors, surfers and fishermen who met on these beaches. The photographer reported that he returned five times more to the park to visit Cape Point and chose that place to propose to his girlfriend. However, NASA clarifies that the coast and the headlands along North Carolina "are constantly in motion" and that these changes are normal.